In many respects, this project has been a great boon to the Republican Party. Research suggests that Fox News’ existence significantly boosts the GOP’s vote-share (and might have even swung the 2004 election to George W. Bush). And, in addition to helping Republicans win elections, the right-wing echo-chamber has given the party a freer hand once in power. More tax cuts for the wealthy, less social insurance for the working class, and near-total impunity for polluters and predatory lenders is not a popular platform, even with Republican voters. 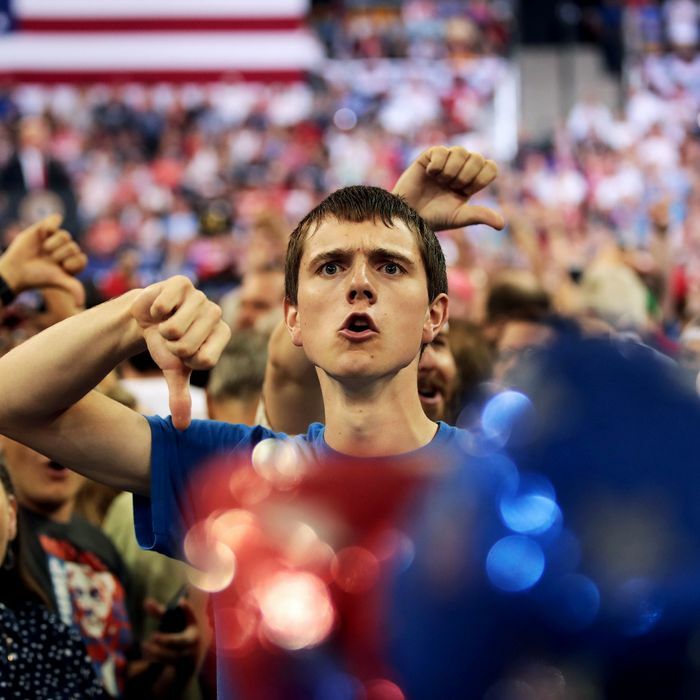 But by supplying conservatives with “alternative facts” about such policies; stoking their cultural resentments and racialized fears; and branding all non-conservative media as biased or liberal (or, in today’s parlance, “fake news”) the GOP has succeeded in retaining the loyalty of its grassroots, while betraying their stated preferences on a wide range of economic issues. But cultivating mass delusion has also had downsides for the GOP — or, at least, for its Establishment. During the Obama years, the tail began wagging the dog — the party’s propaganda outlets went from selling the leadership’s policies to dictating them. Alarmist lies about an imminent debt crisis didn’t just provide momentum to Paul Ryan’s austerity agenda — they nearly forced a debt default that the Speaker (along with all of corporate America) had no interest in. And then, of course, Fox News lost control of its own audience, and the network’s “birther” correspondent became the GOP’s 2016 standard-bearer. Now, Republican consultants are concerned that the combination of their voters’ insulation from reality — and Donald Trump’s fragile ego — could cost the party control of the House. And their fear is quite rational. The party that controls the White House almost always has a tough time mobilizing its base in midterm elections. When voters see their team in power everyday, they feel secure; and thus, complacent; and thus, less obligated to drive to their polling places after work. GOP strategists hope to combat this perennial problem by turning their party’s weakness into a strength: With polls predicting a “blue wave” this November, Republicans hope to instill an energizing panic in their base over the terrifying prospect of Speaker Pelosi. But the president’s narcissism compels him to undermine this gambit. To acknowledge that Democrats are poised for a landslide would be to acknowledge that the American people do not overwhelmingly approve of his job performance. Therefore, Trump has assured his voters that all those reports about a “blue wave” are fake news, and that Republicans are certain to keep Congress in November. Fox News has dutifully echoed this message, and the GOP base has fully absorbed it. The president’s contempt for mainstream polling and the media may come back to haunt him in November. Several top Republican operatives working on the midterm elections told me Trump’s fanciful “red wave” predictions could depress Republican turnout and, ironically, serve to make any blue wave even bigger. What we’re hearing: One of those strategists told me he’s detecting something interesting — and concerning — from focus groups of Trump voters. “You have Trump-MAGA loyalists, and their friends on Fox, who have reached a point of not believing polls and media people telling them things are going wrong, that I believe is actually causing the Republicans problems,” the strategist told me, granted anonymity in order to be candid. If Democrats do retake the House (as probabilistic forecasts currently predict), perhaps the GOP base will finally realize that their movement’s “fair and balanced” media outlets aren’t actually interested in keeping them well-informed. But it seems much more likely that they’ll follow their leader’s guidance — and conclude that Democrats are busing more “illegals” to the polls than they’d ever imagined.